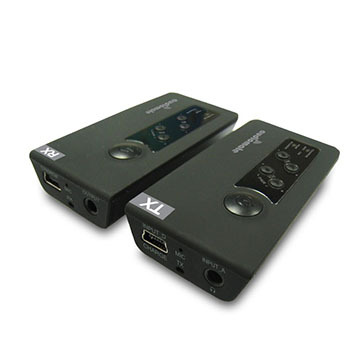 The Audiomate 2-way Wireless Digital Audio Broadcasting Adaptor - AM8232 is designed for dual uses. It can be used to connect your audio components wirelessly. In this 1-way mode, It can transmit audio from your computer through USB audio or any audio devices with 3.5mm stereo phone jack audio outputs to your headphones or speakers wirelessly. It`s as simple as just replacing audio cable connecting to your iPod, smart phones, tablet PCs, computer, TV, surround-sound player, game console, network music player or any other audio source devices. Another amazing feature is that AM8232 is also a portable 2-way communication system with complete exibility and mobility for applications, such as Skype, walkie-talkie or brocasting system without having to lug around unwieldy racks of gear or clumsy setups. If you desire a wireless audio communication adaptor with impressive sound quality,versatility and easy to use then the Audiomate AM8232 is your ultimate choice. 2.4GHz digital automatic adaptive frequency technology for interference resistance and smooth audio streaming. Non-Compression 48kHz –16 Bit high quality audio. Super high S/N and 20 ~ 23 KHz full range Hi-Fi stereo sound quality. Non-compression 8kHz-16Bit high quality voice. Compatible with any earphones, speakers and stereo devices. 360° omnidirectional transmission and reception for free-roaming of up to 30m radius. Compact and slim stylish design for comfortable use and easy to carry. Dual uses of wireless headphone and wireless headset for stereo audio and voice. Built-in Li-ion rechargeable battery and charger for both transmitter & receiver. Built-in omnidirectional microphone in both transmitter & receiver for 2-way communication. 4F,NO.9, Industry E. 9th Road, Science-based Industrial Park, Hsinchu, Taiwan, R.O.C.